Real Madrid and Atletico Madrid have failed to score as many goals as Barcelona's leading two forwards in LaLiga in 2018-19. Lionel Messi and Luis Suarez have now outscored Real Madrid and Atletico Madrid in LaLiga this season. Barcelona's star forwards have combined for 25 goals in the top flight in 2018-19, one more than each of the Madrid clubs have managed. 😯 More than most teams have scored! 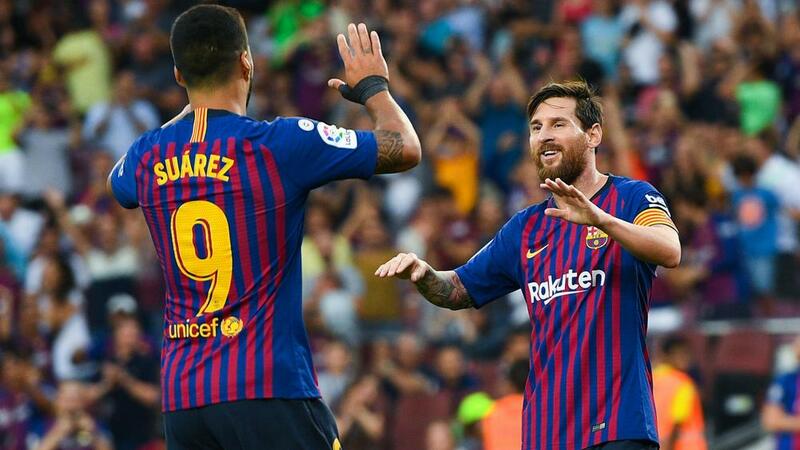 Messi hit a hat-trick and set up the other two goals in Barca's 5-0 thrashing of Levante on Sunday, a result that restored their three-point lead at the top. The Argentine superstar is now on 14 goals and 10 assists for the season, making him the first player in Europe's top-five leagues to reach double figures for each statistic. His treble has taken him to 50 strikes for the calendar year for club and country, the eighth time he has managed such a feat in the last nine years. The win was also Messi's 323rd in LaLiga for Barca, taking him one above former club-record holder Xavi. Suarez, who broke the deadlock on Sunday, is on 11 goals from 15 appearances in the league this term. Barca have scored 46 goals in their 16 league matches, 17 more than second-place Sevilla, who are the next highest scorers.